I have been a Star Trek fan for most of my life. I wouldn’t classify myself as a Trekkie or Trekker (click to see amusing history on definitions), in that I don’t wear a uniform or a “com badge” on my jacket, and I only use the phrase “Make it so, Number One” occasionally when addressing my subordinates. But I do enjoy the various series episodes when alone in my “Home Theatre Man Cave”. Romulans, Klingons, and Cardassians, are the only three alien races known to have type-3 disruptors, the most advanced developed so far, by the 24th century. Disruptors are personal and military small arms that cause damage by exciting the molecular bonds of targets. They are considered less ‘elegant’ than phaser-based weapons; their effects are described as thermal shock and blunt force, as opposed to the ‘rapid nadion effect’ (whatever the heck that is). Disruptors, however, are very effective at achieving the desired result of incapacitation. In 1995, a Harvard Business Review (HBR) article by Bowers and Christensen coined the term “disruptive technologies”, in reference to new upstart companies that came on the scene quickly to provide a substitute product at a lower price. The idea was to steal the “low end” customers of an entrenched competitor, and then move upscale over time. After twenty years of application of disruptive technology approaches, disruption has become a sophisticated strategy, now referred to as “disruptive innovation”. The intent is to dramatically and quickly acquire market share. So what does Social Media have to do with disruptive innovation? In the age of Facebook, Twitter, and Tumblr, internet fads (or “memes”) can infect the whole world in a matter of days. Products can, too. An ad-supported version of the game Angry Birds was downloaded over a million times in the first 24 hours it was available on Android devices. (That number might have been even higher had the enthusiastic response not crashed the developer’s servers.) Seven months later the game had been downloaded more than 200 million times. Upstart products and services in a slew of industries have likewise grown fast enough to leave incumbents gasping. Consider CampusBookRentals and Khan Academy in education, Pandora and Spotify in radio and recorded music, Skype and FaceTime in voice and video calling, and Square in mobile credit-card processing. These offerings’ lightning-fast adoption is a function of near-perfect market information. Wherever customers are, mobile devices let them search a wide range of specialized data sources—including online sites like Yelp, TripAdvisor, Amazon, and other free databases of user-generated reviews—to find the best price and quality and the next new thing. The shock waves from big-bang disruptions emanate far beyond information-based goods and services. Food and cars, for example, can’t be replaced by smartphone apps. But restaurants now depend on online reservations, customer-generated reviews, coupons delivered through mobile devices, and location-based services to drive business. In automobiles, information technology powers sophisticated dashboard systems and, in the not-too-distant future, may control self-driving cars. Disruption is also now harder to detect, because it is practiced as a market entry strategy by companies that are not typically even seen as current competitors. …the untapped conduit for raw, customer-volunteered information. It is high quality and often unseen by many companies. All the more reason to be vigilant using Social Media. Social Media by its very nature is disruptive. It provides access to information – often referred to as Big Data – that was never really available before, and at a level of detail that is actually quite astounding. Disruption is really the art of acquiring new customers and Social Media represents a whole new opportunity to be a successful disrupter. There are a number of areas where disruption can occur, products and services, pricing approaches, bundling of items, etc. My intent in this article is to focus on how Social Media can be used as a disruptive selling strategy in finding new customers and interacting with them to close deals. Social Media or Social Selling? A recent article by Marketing Charts, entitled “Content Marketing Efforts Are Becoming More Focused on Lead Gen” cites a 2013 survey on Social Media Content Marketing by iMakeNews Inc.
Not only is the issue of sales lead generation the most important social media content marketing activity, 49% of those surveyed said the number of new leads was their most important marketing program success metric (KPI) (up from 20% in 2012). 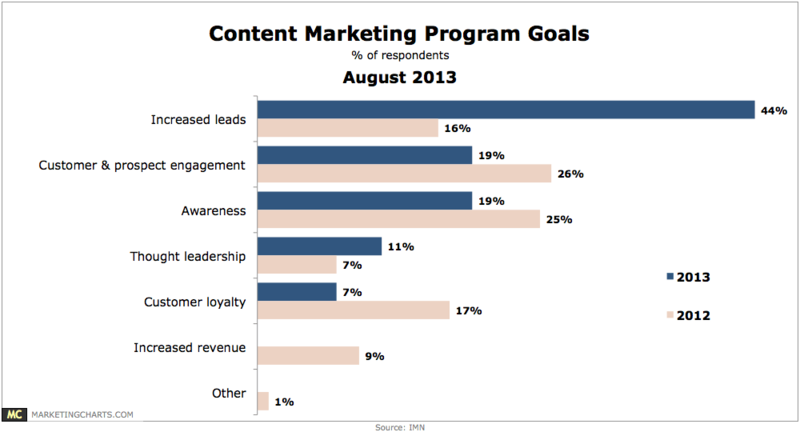 The article goes on to say that this focus on sales leads may lead to increased budgets in this area, although almost half of the respondents said their organizations were devoting less than 10% of their marketing budgets to this activity (Ad Age further supported this number in their late 2012 study finding that 12% of budgets were devoted to content marketing). As an aside, this lagging budget approach won’t work in the new world of disruption, particularly when Social Media provides much of the information to enable disruptive strategies! I would like to provide a recent personal example to support the premise that use of Social Media as a disruptive sales approach (e.g. disruption as previously defined is “interrupting the normal sales process”) can produce real and effective results. Path one was to contact the CEO by phone and then follow up with an email containing some brief background and my request. I would then leverage this approach to ultimately get to the right executive decision maker. Path two was to do some initial research on a variety of social media sites (e.g. LinkedIn, Crunchbase, Quora, etc.) and then using the social media platform tools and analytic partners of ArCompany, identify a path of trusted individuals between me and the target Executive, and then electronically initiate communication along that path to cause an introduction. Long story short; path one led me to the CEO’s executive assistant (as an aside, trust me that in my long sales career, the executive assistant is a valuable ally to cultivate), who in turn introduced me to the CTO and the head of HR, where neither introduction has yet panned out after four weeks. Path two took me a couple of days of prep work, and then in less than one week of “chain letter” (facetious humour alert here) electronic communication, I received an email from my targeted executive offering a set of times to speak. And after less than four weeks, including negotiation time, we had reached a deal … a successful sale! Now admittedly, being a partner in ArCompany gives me the advantage of some very effective social media tools, platforms, partners and skilled resources. But the conclusion (although not statistically validated by me) appears clear; Social Media can generate strong trusting relationships that can help close sales. And even more interesting is that two of the people in the electronic pathway did not “know me from Adam”. They just trusted the previous person in the chain that they knew, and then passed along my request with their blessing. Not only did I close a sale, but I created three new relationships available for future leverage, and two of the individuals I have yet to actually speak with. Disruption is about changing your standard way of doing things, your existing sales processes, and also your sales culture. According to the Harvard Business Review, 60% of the steps of a purchase decision (e.g. researching, ranking, defining requirements, price benchmarking, etc.) are done before a prospective buyer actually contacts potential suppliers. The bulk of this Purchasing “homework” is done online and seeks to get peer opinions from social media sites like Quora, LinkedIn and myriad other forums (see my previous article entitled “I’m B2B, Use Social Media … Who Me?” for more information on which Social Media Services businesses access most). If your sales and marketing people are not regularly monitoring social media channels to see this ‘homework” being done by your customers, they will enter the decision process late in the game. This will often turn off prospective customers, because your sales people may try to force these prospects to cover ground they have already covered themselves. Social Media can also be used to find customers that are in the midst of disruption or major change themselves. This is often a good buying signal on which to search for new sales leads. There are now very sophisticated strategies out there to lever multiple social media tools / platforms and multiple social media services for “disrupting” and improving your existing sales lead generation process. The web disrupted everything, and social media are doing much disruption of their own. Social media didn’t ask for our permission, and it won’t ask for forgiveness. Social media didn’t target a specific demographic or separate us into different segments. It spread quickly and it’s not stopping until every human being on Earth is interconnected. Call it the “social graph” or the “interest graph” or anything you like. If such a map of connections could actually be created / displayed, surely we would agree that the word “disruption” is not an overstatement. We would see that such a “graph” doesn’t care much for borders, classes and other traditional limitations. Human beings are more connected than ever before and we are creating new sub-cultures and habits. Businesses have no choice but to understand the web. They can consider their options in terms of what to do on social networks, but companies no longer have any control over whether such social networks affect them or not. … You may be thinking of opening up a Twitter account while your competition is already reading every incoming message and responding to every single one that deserves a response. Disruption is the new normal. So how do we disrupt? Be one of the ones with a vision that welcomes and challenges disruption. Be one of the ones who prepares for the worst AND best case scenarios. Be one of those passionate and determined enough to deconstruct and reconstruct old patterns of thinking, even if there seems to be no apparent reason to even consider a new way of thinking. Be one of the excellent ones. One of the bold. One of the few. Disruptive sales strategies leveraging Social Media will be the next big selling process and based on Esteban’s comments above, they could provide your salespeople with better access to the entire Human Race. In conclusion, there are three categories your business can fit into: a Disrupter, a Disruptee, or simply irrelevant. Let’s not even go into the third category. So, are you a Disrupter or are you about to be disrupted? Ladies and gentlemen, (including Salespeople) … choose your weapons! Keepin’ a lookout over your shoulder may also be a good thing. Seek to disrupt yourself… before it’s too late. And let me know what you think and share your own experiences. after a month. But you won’t see those numbers. that is a huge improvement. is ok…they are still buying from you but just ignoring on social. Howie Goldfarb bobjonesarc Disruption is a word that is somewhat “overused” lately. It seems when you turn the corner, there’s a new disruptive technology abound. If social media, in and of itself, was disruptive then everything that comes afterwards becomes a test to figure out what works, what resonates and ultimately what’s acceptable to consumers. The fact of the matter is the last 6 years has been one big test and learn: Howie, what you’ve mentioned about Angry Birds has become just “meh” performance because of there are others like Diner Dash or Mailbox that were more noteworthy. The thing about disruption is that at some point in time it becomes commonplace. Everyone, including their grandmother, knows what Twitter is regardless whether or not they choose to use it. Once something becomes commonplace everyone rushes towards it and tries to make sense of it and apply it to their business practices because “everyone says so”. The Klouts and Ted Rubins were early to the game and attempted to instil some basic definitions and rules to help frame the space. Overtime we all got really smart and debated on the practicality of these positionings. And we will continue to do so. These days social media MUST somehow show business the detour or alternative path to revenue and sales. It’s the only way it will sustain itself. And perhaps you may be right about the differences between B2C and B2B. But as a marketer who is hell bent on measuring everything, I’ve seen put less emphasis on Facebook Pages, the value of a fan or follower and have looked, instead, to the value of content and other variables of influence that have a beeline to conversion. The nice thing about being in a disruptive era — we learn very quickly — and we, as early adopters, begin to lead by example. Howie … Thanks for sharing your views on my blog. After all blogs are meant to seek opinions, drive conversation and perhaps even cause some learning. As an aside, I also like your profile line “Still loves mischief and daiquiris”. – I believe the HBR authors I quoted on the Angry Birds example were trying to illustrate how quickly the market adopted the game, not that it had any longer term impacts. Perhaps a better example of a disruptive technology for gaming, would be the rapid adoption of home gaming systems such as the Sony Playstation or the Microsoft Xbox, and the longer term disruption they had on closing down Pinball and Electronic Gaming Arcades. A notable long term impact to be sure. – Regarding the notions of “disrupting” and “enabling”, I don’t see them as mutually exclusive or even the same thing. Most often a disrupting event provides improved (or enabling) capabilities to the business or consumer end customers, but it also destroys a provider in the process. Most disruptive technology examples have historically been product related, but in my blog I am trying to show that processes or approaches can also be disruptive, particularly sales processes. My example here would be in the Car industry: the entry of online sellers like AutoTrader.com (and others) caused many of the car dealerships to shut down, despite the fact that both were selling the same product (new and used cars). Clearly this different sales approach interrupted the dealership business with extremely disruptive results. This is also a B2C sales process that made it easier for the consumer to find and buy the car they most desired without actually spending time going from dealer to dealer or car company to car company. This in turn also made it easier for the seller (private or dealer) to generate sales leads / prospects. — Sales process, B2C, easier and very disruptive. I also suspect that AutoTrader and others, have not yet really leveraged the intelligence that the Social Media Universe can provide. So stay tuned to see how things play out when these companies (including players like Amazon) really learn how to leverage Social Intelligence (e.g creating more informative customer profiles with both business and personal preferences, visibility on connections between customers and influencers that is usually very tough to find through conventional means of “list buying”, or “word of mouth”, or broad email campaigns, etc.). – I quite agree that Social Media is about marketing support, data mining and customer insights / feedback. But once this information is collected, filtered and processed, it really can be used by both B2B and B2C to target their sales campaigns and programs either through the dedicated sales forces (more B2B) or through Loyalty Programs (more B2C). I believe that Loyalty Programs, in many respects are lead generating machines for repeat customer business. It is ArCompany’s experience that most Big Business Loyalty programs lack meaningful information about the members preferences, their background and their actions (in areas other than specific purchases from the business owning the loyalty program), which can be garnered through Social Media channels. Assuming the data collection and processing is done in a “customer permissive / respect for the individuals desired privacy” manner, the results for generating repeat business (sales leads) can be profound and positive for both the business and the consumer / member’ satisfaction. – Finally, my partners at ArCompany and myself share your concerns about the use of metrics (e.g likes) that don’t really tell the whole story about business performance through Social Media channels. I recommend you have a read of Danny Brown’s recent book: Influence Marketing: How to Create, Manage and Measure Brand Influencers in Social Media Marketing (http://s.wisestamp.com/links?url=http%3A%2F%2Finfluencemarketingbook.com) to get some further insights in this area. Hope my comments and examples above are useful … thanks again for sharing you views! Howie Goldfarb I enjoyed your article, particularly as a B2B marketer who is often looking to ‘disrupt’ market sectors as many clients are challengers rather than leaders. However, my personal view of social media is it is a relationship and trust builder. I don’t see it as a disruptive tool, it of course can be used and has been used to do so many consumer brands, it is far more powerful in B2B in assisting to reach the multi-layers and through content and conversation, build engagement. This in itself can be disruptive if a longer-term and integrated approach is taken.